The virtually-unbeatable Australians have revealed their lineup for the 7th annual edition of the ISA championships. Here’s the team that will be flying the green & gold on the shores of China later this month. I’ve also done some extended analysis of Team Australia for the superfans. While we haven’t heard much from the ISA about this year’s Worlds (the event starts in just 18 days but the official site still points to last year’s championships), national teams have been busy prepping squads for the annual showdown, which this year is set for Hainan, China from November 23 – December 2. Original host Brazil lost the event a few months ago. We’ve already seen the lineups of other top contenders Team France and Team USA, and Australia now completes the “big three” announcements. 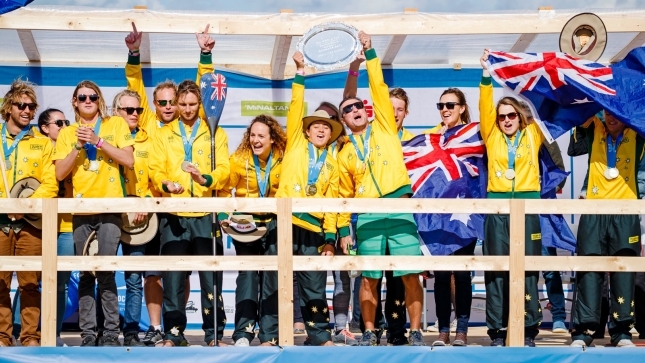 Check out the full analysis of Team Australia or simply take a look at the team lineup below. You can watch the 2018 ISA Worlds on Facebook Live starting November 23rd. Or at least, I presume there will be a webcast — SUP Racer wasn’t invited to participate this year (the ISA doesn’t handle criticism very well, apparently).